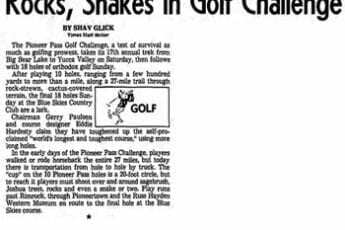 YUCCA VALLEY – Roger Lenhardt was installed as president of the Pioneer Pass Golf Challenge, Inc., last week at the Yucca Valley Country Club. Others who will guide the corporation during the coming year are Art Acason, vice president; H. Welling Clark Jr., treasurer; Ed Rance, secretary; Midge Tunstill, corresponding secretary; and directors M. R. Williams, Harold Van Nest, Les Johnson and William Hanson. How Fischer retiring president, Will serve ex-officio next year. 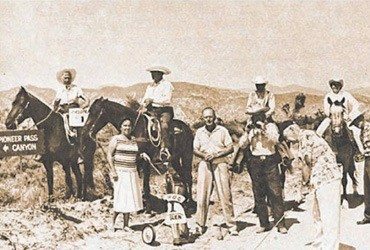 Next meeting of the corporation to draft the program for the October 1962 golf of that, which includes the “world’s longest and only 19th hole” from Pioneertown to Big Bear City, will be held on December 27 at that Yucca Valley Country Club coffee shop. 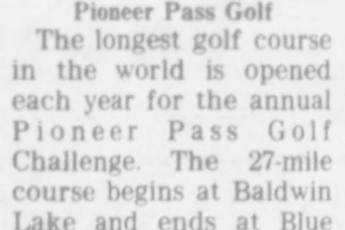 Pioneer Pass Sets 4th Golf Event in Oct.